the other module i had in semester 1 (year 2)was Entertainment Design. our main task was to conceptualize a game from a given title. we only had to make one idea but i went above and beyond the call of duty and created a rough concept for every given title. serious fun = minigames set in an office enviroment using hazards like vending machines and staplers,like an anarchist version of warioware and incredible crisis. 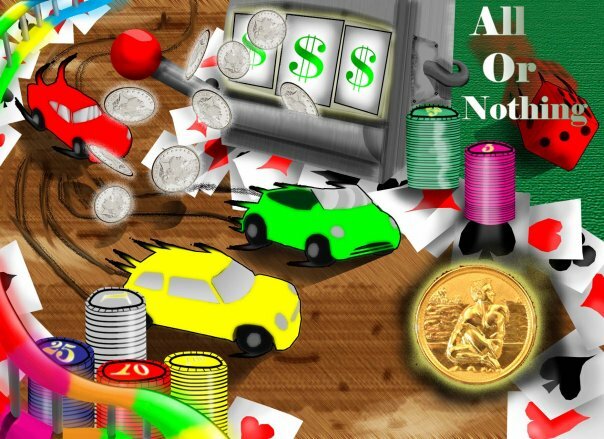 all or nothing=a micro machines rip off which a very innovative twist,instead of racing for first or last place,collection and gambling were more decisive factors to victory.it`s set in a casino. due to overwhelmingly positive feedback from my pitch and crit groups i decided to go with the all or nothing concept. i had many,many ideas on how i wanted this game to work but a lot of it had to be cut,besides the final product was only meant to be a small demo of the full product. in the final game i didn’t get either a track counter of collection up and running but the aversion to actual racing is an idea im quite proud of. it takes guts to stand out from the cookie cut plethora of racers out there,and along with the attractive enviroment i felt like my concept had legs. when it came to actually coding and creating the game,it was a nightmare. actionscripting is a slow,laborious process with no room whatsoever for error. 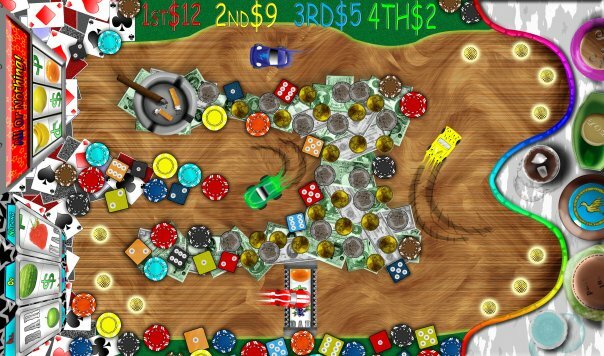 so instead i went slightly mad on the artistic side of things,creating hundreds of frames of animations for different coloured poker chips and dice,and even incorporating complex animation loops into the level such as refilling drinks and forever spinning slot machines. the sound design was a lot of fun too. i made sound effects for everything from ice falling into a drink and coins and chips spinning on the floor before falling over. the highlight of the sound aspect though was the inclusion of the small faces classic song”All or Nothing” it fits perfectly with the atmosphere of the game and i wanted to include a trippy dream like intro to the game which would involve the cars driving behind glasses of various alcohols distorting how they look,similar to a house of mirrors,being as the song has a very trippy beat and wouldn’t seem out-of-place in a 60`s hippy stoner`s record collection. it supports 4 player on one keyboard. and thanks for taking the time to read my grand rants.